Staxel is an RPG title that gives the player a chance to live in a small town. You can e.g. cultivate land, create gardens, trade, and craft items. Published on PC, Staxel is an RPG title in which you can try what it is like to live in a small town. The game gives you a chance to e.g. cultivate land, create gardens, trade, and craft items. It is also important to maintain good relationships with NPCs and explore the world, including its dungeons stuffed with monsters and traps. 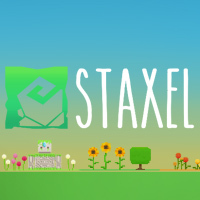 The title developed by Staxel Team features a few characteristic sandbox elements. The action takes place in a sleepy, fantasy town which shape and borders are randomly-generated at the beginning of each new game. The production offers much freedom and does not focus on the plot. During gameplay, you can e.g. plant, gather crops, sell them on the local market, or design gardens. The title also features trade and a crafting system, which enables the player to create furniture, tools, etc. The town is inhabited by a number of NPCs and interacting with them plays a key role. Maintaining good relationships with people and other races grants access to new resources, items, activities, and quests. The map does not only consist of the town. Across the border, there are e.g. areas inhabited by elves or undergrounds controlled by mole people. There are also dungeons characteristic for RPG titles, where the most valuable items and resources can be found. However, obtaining them means fighting monsters and solving logic puzzles. Staxel for PC features both single and multiplayer. In the latter, the players start their own servers on which, together, they can work on farms, construct buildings, and raid dungeons. Expectations: 8.4 / 10 calculated out of 28 players' votes.